The Collegiate Chorale is the university’s primary touring ensemble. For nearly two weeks this summer, thousands of singers from around the world will descend on Cincinnati for the “Olympics of choral music,” and Wright State’s Collegiate Chorale will compete at the event’s highest level. The World Choir Games is the largest choral competition in the world. More than 360 choirs from 48 countries will compete in 23 musical categories during the 2012 Games. The Wright State University Collegiate Chorale will compete in the Champions Competition in the Mixed Chamber Choirs category on July 12 and in the Musica Contemporanea category on July 13. It will also perform in a celebration concert on July 11 at the Aronoff Center. The Wright State University Collegiate Chorale is the university’s primary touring ensemble. Its repertoire features a wide range of musical styles. The group was recently featured in the Dayton Philharmonic Orchestra’s landmark production of Bernstein’s MASS. Members of the Chorale are chosen through a highly competitive audition process. This year, the group includes 32 students from a variety of majors. “It’s been a wonderful opportunity to broaden my horizons to new music and new composers,” said junior music education major Elyse Marshall of her participation in the Collegiate Chorale. Touring annually, the Chorale has sung throughout the United States, Germany, Austria, the Czech Republic, the Netherlands and England, including such venues as Salzburg Cathedral, Washington National Cathedral and Carnegie Hall. 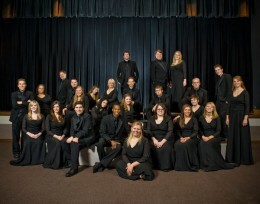 In 2012 and 2013, the WSU Collegiate Chorale will tour Washington, D.C., France and Belgium. The Collegiate Chorale will preview its selections for the World Choir Games in concerts on Thursday, May 31, and Saturday, June 2. Both concerts will be held at 8 p.m. in Schuster Hall in the Creative Arts Center. Tickets are $12 at the door.